The LedTech Slimline 1m Tri-Colour LED Batten features 24 x 3w Tri-Colour (Red, Green & Blue) LED's. The batten requires a suitable 24v LED Driver and control system such as our RF Remote control products or by DMX through our DMX512 decoders. The batten is IP65 rated (splash proof) so suitable for indoor or outdoor use. This 1m Slimline, Tri-Colour LED batten is designed and manufactured using quality components to ensure reliability and longevity. The battens are compact enough to be mounted discreetly so are ideal for installation under a buildings eaves to create a colourful wash of light to the walls. They are also popular for use on exhibition and display stands to create a bright, colourful wash to an area or exhibition stand wall. 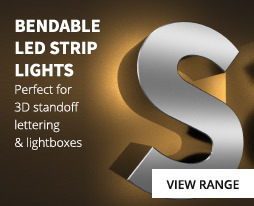 Despite the compact size and low running costs, the light output is excellent and as they are IP65 rated they can be mounted in damp conditions. 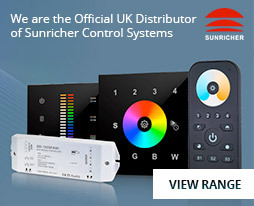 The battens require a 24v power supply and a suitable control system such as our RF remote and wall mounted controllers including our range of SunRicher products. In addition, we stock a variety of DMX512 decoders so that the battens can be connected to a DMX system. It is possible to link (daisy chain) up to three battens together when connected to a suitable controller and driver.